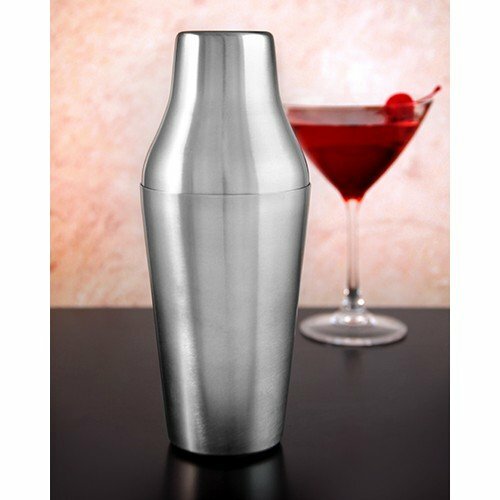 An elegant Master Mixologist bar tool, this Two Piece Parisian (French) Shaker, constructed with heavy-duty brushed Stainless Steel, holds 18 ounces and features an oversized top to allow for optimal mixing. Our two or four prong wire strainer fit perfectly. Measures 8 5/8" in height. An elegant Master Mixologist bar tool, this Two Piece Parisian (French) Shaker, constructed with heavy-duty brushed Stainless Steel, holds 18 ounces and features an oversized top to allow for optimal mixing. Our two or four prong wire strainer fit perfectly. Measures 8 5/8" in height.